← I Have Nothing To Wear! There is a movement gaining traction in the restaurant industry to take servers off the current tip based payment system and put them on a salary. Higher salaries would mean a higher food bill for the customer, but a fairer pay scale across the board for servers and cooks. 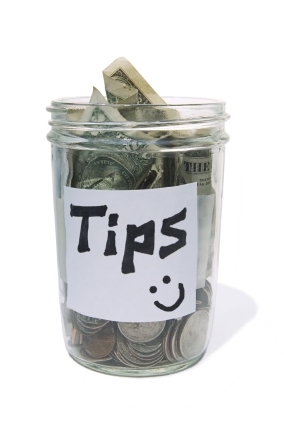 Removing the optional tip on food bills would also eliminate the “punishment” that servers sometimes incur in the form of low tipping or no tipping patrons who are unsatisfied with their meals or their servers performance. I know first hand what the “punishment” for poor performance looks like: it is a table full of dirty dishes and no tip hidden under the plates. Back in high school I had a good friend who was a waitress in our local diner. She offered to train me so I could take her place on the breakfast shift and she could move up to the lunch shift. My friend persuaded the owner to hire me by telling him that I had “a little experience” in waitressing and she would take full responsibility for my training. The boss knew what we were up to, but he liked my friend, and she was a good waitress, so I guess he thought I would turn out the same way. “You can’t do much damage with breakfast orders,” my friend told me. “Breakfast is an easy shift to learn on.” But no matter how much she tried to boost my confidence, I still goofed up. People would order the #2 Special: 2 eggs, toast, bacon or sausage, juice and coffee or tea, and I would forget to ask them how they wanted their eggs. I would forget the coffee creamer, or the juice. No one ever got coffee refills. Wasn’t one cup enough? Besides, I had other customers to take care of. I knew I was losing control of my tables when multiple people from different ends of the restaurant would call out: “Miss, you forgot the juice,” or “Miss, can I get my coffee now?” At those moments my friend would run over with a coffee pot and refill the cups, put juice and waters on the table and quiet everyone down before the boss would notice. One morning, she put me on the counter. “This will be easier for you,” she said. “But you’ll have to learn to make coffee.” As the counter waitress, I was responsible for making sure the huge coffee urns were always full. There could be no lapse in the morning coffee supply, and it took at least ten minutes for the coffee to drip down into that behemoth coffee urn, so there had to be one full machine to draw from and one in the brewing process at all times. My friend heard the whisperings and rushed over to the counter to find me fumbling with the coffee bags, red faced and close to tears. What did I know about adults and their drug dependence on caffeine? I was only 16 at the time, and wasn’t yet a coffee drinker myself. The two policemen, who always ate for free at the diner, left me tip-less that day. I can’t tell you how many times I had to go back to other patrons and ask, “What kind of toast did you want?” or “How did you want your eggs prepared?” I never ate breakfast, so it never occurred to me to ask how anyone wanted the eggs prepared. If they didn’t tell me, I assumed they wanted them scrambled. My guess was wrong and I had to send the egg order back to the cook who yelled at me in Spanish. By the time the poached eggs came out, everyone else at the table was done with their breakfast. They left me tip-less. I had no sense of timing and I brought orders out late, and cold, and had to return food to heat it up. Those tables left me tip-less. I would forget stuff under the warming lights until someone would ask me where their food was. Those tables left me tip-less. I walked back home every day after my shift; my friend stayed on for the lunch hour. It was just as well. The 20-minute walk by myself gave me time to have a good cry and let out my frustrations. I hated that job. I hated the way some customers spoke to me, like I was beneath them. People could be so nasty when their food wasn’t prepared the way they liked, or if their coffee cups weren’t filled fast enough. I had to watch out for the cooks in the kitchen trying to pinch my behind and pretend I didn’t hear some male customers at the counter making lewd remarks behind my back. I held out for three weeks, hoping it would get easier once I got the hang of things, but it never did. It was the worst job I ever had in my life. My heart sunk and I felt my face flush. Did I screw this up? I wondered, as I looked down to check my copy of the ticket. “You said, ‘filet of flounder,’ didn’t you?” I asked him, seeing it written there, plain as day, on my memo pad. Debbie was my good friend who was training me; she wasn’t there that day. We did have some physical resemblance to each other. We both had the same dark hair and similar hairstyles. We were both about the same height and body type. I could see how an old man, with poor eyesight, might be confused and think we were one and the same person. But now I was afraid what the cook would say when I brought the fish back to him for a do-over. It was one thing to bring back a plate of scrambled eggs and exchange them for poached, but filet of flounder was one of the most expensive lunch items on the menu. “Debbie isn’t here today,” I told him. “If you wanted it stuffed, you should have told me.” I tried to convince the old man that this unstuffed fish was just as good as the flounder stuffed with crabmeat. I even tried a little flirty smile, but he wasn’t having it. I walked into the kitchen with the plate of flounder and put it on top of the pick-up counter. “What’s wrong with the fish?” the cook asked. “He wants it stuffed,” I told him. He started screaming in Spanish, turning around in circles and holding his head. That brought the owner in to ask what was going on. “She brings back the fish and tells me to stuff it!” he shouts to the owner. With that, the owner’s face gets purplish-red as he starts yelling at me in Greek (I think). He walks over to the plate of fish, grabs it and starts banging it on the counter, screaming and banging, harder and harder until, finally, the fish goes flying off the plate, over his head and hits the back wall over the stove. Needless to say, that was my last day as a waitress. I ran out so fast and never looked back. Since then, I have the utmost respect for servers and probably over tip, as a result of my three weeks in the trenches. Today, I would probably be a great waitress. After cooking and serving thousands of meals for my family, over the past 39 years, I certainly have plenty of experience and know the right questions to ask. I always bring the food out hot and I know exactly how everyone likes their eggs and toast. Problem is, I’m still cleaning off a table full of dirty dishes and not finding a hidden tip under the plates. Some things never change. This entry was posted in Uncategorized and tagged diners, Humor, tips, waiters, waitress, working for tips. Bookmark the permalink. Being young and inexperienced has its drawbacks. I too was a waitress and can remember my one and only panic attack that happened at the height of Saturday night dinner. I had too struggle to get through it. Your story brought back the time I was trying to join the adult work world. I felt all your situation as your story unfolded. You have a great way with words and humor.